A steep climb up on to Calf Top, England’s newest mountain, from Barbondale before a gentler return via Castle Knott and Eskholme Pike. Calf Top, the summit of Middleton Fell, has recently been declared a mountain after a recent survey found that by the smallest of margins (2mm!) it met the qualification height of 2000ft. By coincidence I’d been planning a third visit to Calf Top, one that would forsake the usual route up from Barbon and instead make a direct climb from the Barbondale side. It was a morning full of promise when I arrived in Barbon, a village in Lunesdale situated off the road between Kirkby Lonsdale and Sedbergh. Parking on the roadside opposite St Bartholomew’s Church at the eastern end of the village I crossed over Barbon Beck to take the bridleway heading east into Barbondale. This first section of the walk, on a good track, was through some lovely woodland and was made more picturesque by the shards of sunlight slanting down through the trees. Passing through the woods I entered a more open area which was dominated by the steep flanks of Castle Knott up to my left and by Barbon Low Fell to my right. At the end of the bridleway I crossed Barbon Beck by a new footbridge, built in June 2016 to replace the previous one that was damnaged by floods in December 2015. Turning left I continued for the next mile and a half along Barbondale Road. Apart from cyclists there was very little in the way of traffic and there was plenty of verge to escape any passing cars. One thing that did strike me was the four or five campervans I passed parked in various spots off the road. The views up and down Barbondale on this section were quite lovely with the beck in the foreground and the steep slopes of Castle Knott and Calf Top beyond. My only disappointment was that the numerous waterfalls shown in Three Gills and Short Gill all turned out to be dry. Eventually I reached a cattle grid at which point it was time to recross the beck, which was also virtually dry now, and begin the long steep pull up alongside the wall. After a week in which I’d found it hard to de-clutter my mind I found the physical exertion of this climb to be particularly therapeutic. For the most part the going was fairly easy but either side of the small outcrops near the Hanging Stone the ground steepened enough for me to sometimes use my hands as well as feet. On the other side of the fence from the Hanging Stone I sat on a slightly wider outcrop to have my lunch and enjoy the fantastic views. Afterwards, sat with my legs dangling over the edge of the rock, with warm sun on my face and a pleasant breeze I practiced a bit of meditation and for the first time that week managed to temporarily clear my mind of worries. Following lunch I nipped over the fence to take a few photos on the Hanging Stone before commencing the steep climb alongside the fence. Eventually the going began to ease. Finally as the fence curved to the north-east I was able to catch my breath on the final easy strides to the waiting summit. My last visit to Calf Top had been in rain and thick hill fog so it was wonderful to enjoy the far reaching views that included the Lakeland fells, Howgills Fells, Dentdale, Rise Hill, Great Knoutberry Hill and Great Coum. After taking a number of photos I retraced my steps back to the fence corner before continuing on the grassy path heading south over Castle Knott, crossing over a particualarly moist area in the col between the two fells. Castle Knott is a fine hill in its own right and although the view to the north is obscured by Calf Top it is still fairly extensive in all other directions. 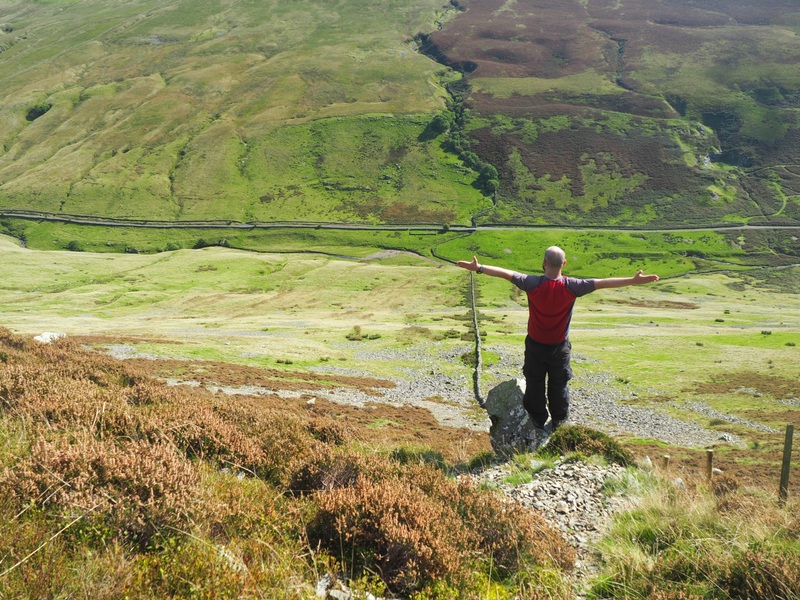 The descent from Castle Knott is particularly enjoyable with great views ahead of the Lune valley and at its northern end two fine features in the Silurian outcrops of Eskholme Pike and Devil’s Crag. From Devil’s Crag it was a short descent down to the path between Eskholme and Barbon, turning left on this it was then a nice easy stroll back to the start.